Protecting what is left of our wetlands is a key component of environmental sustainability. Wetlands are one of the fundumental building blocks of our ecosystem. Freshwater wetlands – bogs, marshes, and swamps – act as natural filters for our ground water supply, reducing the need for expensive investments in water purification. They also protect us from floods by absorbing water and releasing it slowly, which reduces the costs that we might otherwise pay for insurance and cleanup. They provide crucial habitat for migrating birds and a wide variety of other wildlife. Moreover, wetlands also serve as incubators supplying our sport and commercial fisheries. Sustaining our wetlands is an important way to protect both human settlements and natural habitat. This indicator shows the change in wetlands since the late 1980s. Permits are now required to disturb wetlands for development, and mitigation projects that build or restore wetlands elsewhere are often required. 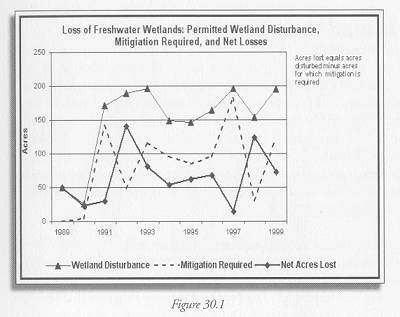 Figure 30.1 shows the number of acres for which disturbance permits were issued or mitigation required between 1989 and 1999, and the resulting net loss – the difference between disturbance and mitigation. As it shows, we are losing between 20 and about 120 acres of wetland per year, so even if all mitigation is successful, we are not sustaining our wetland resources. Since we have shown a net loss in wetlands every year since 1990, we must be moving away from the Department of Environmental Protection’s target of a net increase by 2005 relative to 1998. Wetland loss has been going on in New Jersey for centuries. Approximately 15 percent of New Jersey’s land remains freshwater wetlands, some 700,000 acres. The New Jersey Department of Environmental Protection estimates that the state lost 39 percent of its wetlands between the 1870s and the 1970s; half of that between the 1950s and 1970s. Population growth and spreading land development are major causes of wetland loss in New Jersey, as elsewhere. State and Federal laws now require mitigation to offset many authorized wetland disturbances. Mitigation may include restoration and enhancement of existing wetlands, creation of new wetlands, purchases of credits from a mitigation bank, or contribution to the state’s Wetlands Mitigation Fund. Studies are still underway to assess the success and viability of manufactured wetlands; it will be some time before we can be sure that they provide the same ecological services as natural ones. If mitigation is not successful, then authorized disturbances will essentially be the same as net loss, and we are much worse off than this indicator suggests. Moreover, these data are based on permits to legally alter and fill in freshwater wetlands; to the extent that wetlands are filled illegally or permits are issued for development that never happens, they are inaccurate. Figure 30.1 Data provided by Michael Aucott, NJ DEP, Spring 2003. By 2005 there will be a net increase in wetland acreage relative to 1998. We have had net losses of wetlands each year.